OK, things could be worse, but when you’ve planned a trip and you want to escape the day to day routine and relax and refresh your spirit with people you love, or return home from business, you just don’t want a delay. But here I sit, on a Sunday afternoon at the airport, waiting out a delay. In the end I trust the delay will not end in disappointment. I expect that I will be reunited with my friends and we will fill in all the gaps that have transpired since we last saw each other. I find it interesting that the departure sign doesn’t say, “Delay.” but rather, “New” Hmmm, we aren’t delayed, we just have a new time! How exciting! It’s almost as if being new makes it better. NOT. God has his reasons for every delay, including this one, and I feel like I need to apologize to everyone on this flight. 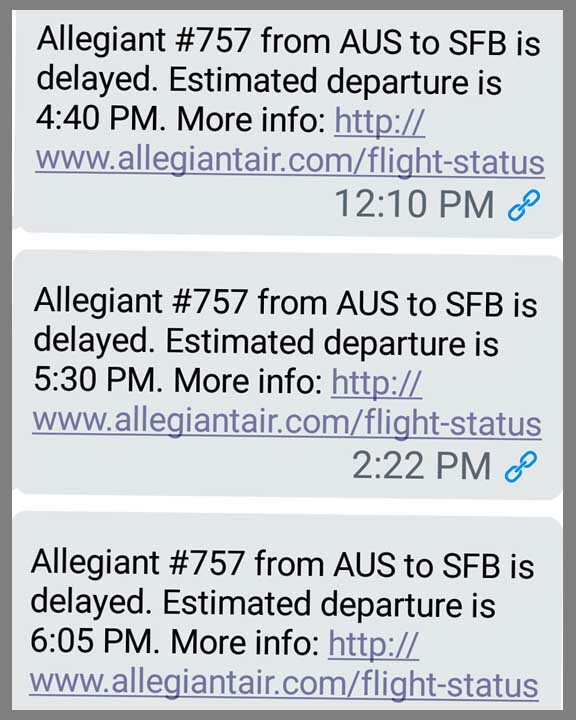 I think this delay is my fault. You see, I didn’t write a blog post for Tuesday, I just ran out of time, and now, suddenly I have a few hours to kill, an iPad in my lap, and a topic… Delays. I don’t do waiting well. I never have. I don’t know too many people who do. Most of us, I think, would prefer to rush from point A to point B with little time to spare, but God often has a different idea. God often has us wait. Sometimes God has a new time for us, other than the one we scheduled. When you think about it, much of life is spent waiting. We wait for people, appointments, and phone calls. We wait for job interviews and pay days. We wait for birthdays and holidays. We wait for test results. We wait for prodigals. We hold hands and sit by hospice beds and wait for death. We wait for God to draw our friends and family members into saving faith. Waiting is a power tool in God’s hand! And as long as Romans 8:28 is in the Bible (and the last time I checked it was still there), we know for a fact that God uses our waiting periods for his purpose and our eternal good. As I sit, waiting for this plane, I did a search on waiting and I found an interesting little detail: wait, hope and trust are interchanged in several verses between the NIV, NLT, and KJV versions of the Bible. What do we learn from this? Is waiting the same as hoping, as trusting? Yes, I think so. Can we truly wait if we don’t have some assurance that what we are waiting for will come to pass? I don’t think so. Otherwise we are simply killing time. I feel fairly confident I’ll eventually get on a plane today… So I wait. What about waiting on God — when he chooses not to fly on our timetable? We can trust that he is never late; his timing is always perfect. His timeframe may not be what we think we want, but it is always exactly what we need! Therefore we can place our trust in him. And our hope, placed in him, will never disappoint us. God’s faithfulness should enable us to wait with patience, and glean everything we can out of our times of waiting. When we grasp the idea that God is with us in the waiting, why should any delay bother us? Our times of waiting are perhaps God’s times of slowness to anger. Perhaps his slowness to anger is the grace that enables us to see his love, faithfulness and forgiveness. Maybe this is why hope and trust are interchangeable with waiting. Perhaps we should welcome his delays. We may never know all that God is doing while he has us wait, but we know that our responsibility is to wait well. Maybe we need to think of waiting not as a delay, but as an opportunity to embrace a new time; a time God has set. What are you waiting for? Will you trust that God is faithful and has a purpose in your waiting. Will you place your hope in him and work with him for his glory, and your good, as you wait. Will you choose to trust that his arrival is always perfectly timed. I know you will use every minute in the airport to the glory of God! I am always short on patience. I wish I wasn’t. But I am. And so I pray for this. …and God always answers that prayer, it seems, by giving us ample opportunities to practice using the patience he gives us. I love how the 3 different verbs are used in the different translations and how they enhance the meaning of the verse.